Today I am posting a review and helps section I wrote for our friends at "What's In The Bible?" "What's in the Bible?" is an excellent curriculum produced by Veggie Tales creator Phil Vischer and his team at Jellyfish Labs. It's designed to walk kids and families through the entire Bible. 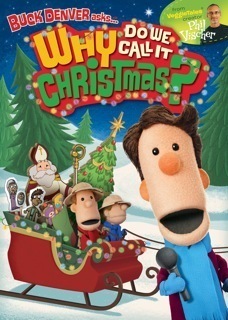 For Christmas, they have designed a series called "Why Do We Call It Christmas?" The series is intended to give children and families a historical context for our Christmas traditions. Join intrepid newsman Buck Denver and all of his friends on an amazing journey into Christmas that will have your classroom singing and laughing and creating all the way through the Christmas season! You can order the series at this link. If you are looking for a Christmas series, it is great. I will be giving away a free copy of the series ($79.00 value). You can enter for the drawing by emailing me at dalehudsoncm2@gmail.com. I will choose the winner next Monday, Nov.14, and post your name here on the blog.